The relationship of Leo and Pisces can be simultaneously fascinating and frustrating! Leo is direct and generous with affections while Pisces lover is probably just as generous, but the style, however, is different. Leo is personal, while Pisces’s loving nature is “universal” which makes the Leo feel insecure. The typical Pisces male is often pulled in two different directions and as such may lack determination at times. He loves being in a cozy and secured environment. He is cool, calm, informal and caring. When he is cheerfully given all the freedom he needs, he is always a faithful lover and a loyal husband. But when his freedom is smothered, he feels nervous and restless, and begins to slip and slide. Most reliable way to insure loyalty is to have complete faith in his integrity, to let him know his love and his support is needed and appreciated. A Leo woman is bright, cheery and most of the time, fun to be around. She loves challenges and takes them head-on. She is full of pride and elegance and doesn’t stand to any ridicule. She is compassionate and warm and has a forgiving heart for ones who really love her and sincerely ask for her forgiveness. The exception to this is when she goes through her times of self-interests and egoism. She melts to her lover’s poetic and romantic side and shows generosity and loyalty like no other if she has respect and admiration given by her man. Romantic and passionate nature of this individuals waters this relationship to grow to the fullest. The invincible nature of a Leo woman may bind this relationship to cherish the long-term compatibility. If fights are put at a bay then they can enjoy the dish of love every day. A Leo woman and a Pisces man form a supreme love pair. But, sometimes a clash may arouse due to the selfish nature of a Pisces man which may not suit with the generous nature of a Leo woman. Leo woman craves being the center of attention whether it is in a social group or in the company of her lover. Show her Pisces man’s romantic side and he can win her heart. Show her his infidelity and she shows him a side of her that he just doesn’t want to experience. Leo woman turns her warmhearted and loving nature to a hardhearted evil woman that is not so easily distinguished if her Pisces man is not true to her. Loyalty is one of her finer virtues as long as her trust and faith is instilled into him. Little gifts for no reason at all, compliments to her, showing her that he desires and perhaps even needs her in his life, even a small hint of jealousy when she acquires the admiration of others can do miracles to their relationship and can show her that he is indeed the man for her. 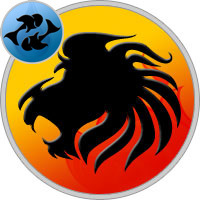 A Pisces man with his charming nature, mild kindness and passive resistance has the ability to calm his Leo woman. He is an avid listener and doesn’t mind stepping back. Since she loves a good listener, this works out perfectly in this relationship. He is known to stay somewhat in the background of things — so as long as he is not intimidated by Leo woman and her noble approach, he does not mind dealing with her dominance. She can lecture her Pisces lover on the need for him to praise her. As long as she does it subtly and not too excessively, he listens with a close ear and open heart. Too much of this sort of conversation and bounding, however, turns him off as fast as his infidelity would turn her off. Although they both have some common qualities they share, it is not enough to keep this relationship strong. They’d be much better bonded as friends than as lovers. The elegant oneness of Leo woman and Pisces man is one of a kind. They can always have something to keep them intact and value each other. All of this coupled with his quick wit, intellect, charisma and ability to change according to his Leo woman’s moods surely touches her heart. She also teaches him to assert him and fight back and to stand tall. Together they make a perfect duo of confidence and humbleness with so much to give to their partner and so much to treasure on their relationship. She knows how to tenderly calm her Pisces man’s inner fears and he knows how to soothe his Leo woman’s injured feelings. This is a couple which shares a compassion for each other’s weakness and enjoy a truly royal fairy-tale romance. The sexual relationship of Leo woman and Pisces man is enhanced by his romantic nature, delicate touch and tenderness he shows to his Leo lady, as well as her warmth, loyalty and extreme passion she adds. They both are capable of treating love as a high spiritual exaltation. He needs complete emotional fusion and a sense of mystical unity in the sexual consummation of love while she seeks more tangible fulfillment of warmth, affection and passion. She needs sentimental verbal expression, both before and after love making while verbal expression of love is not such a good idea for him who believes it to be unison of emotions and souls. To make her satisfied, he has to be stronger and bolder in his expression of love both physically and verbally. If, however, he is too delicate, spiritual and elusive and she tries to be too dominant or overwhelming in her passions, it causes him to become disinterested and disconnected from her and this can make their sexual intimacy more a bitter experience then something to be treasured. Leo woman being the extroverted and outgoing socialite and Pisces man being the withdrawn and mysterious one, the two don’t really have a lot of common ground to have a bond strong enough for love. He finds her extroversion sometimes sharp and unnecessary. She is extreme in her expression and needs the occasional fight with him to put the fire into their relationship by making up afterwards. His ability to match her fiery expression is not so easily attainable. He is more apt to withdraw himself to lick his wounds after she finishes putting down his spirit. Another problem is his inability to express his deepest thoughts and desires. Keeping them to himself makes his Leo woman think that she is not important enough to him to tell her what he feels. However, if they both compromise considerably for the other one, it is a possibility it can work.